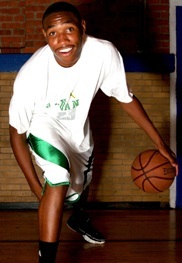 One of the remaining names at the top of the priority list for the 2008 recruiting class is Mount Vernon (NY) forward Kevin Jones. Jones is a 6’8″, 215-pounder who can hit the outside shot and go inside as well. The past two seasons, Jones has led his Mount Vernon high school team to back-to-back state titles. Oh and by the way, he’s in the National Honor Society. Indiana head coach Kelvin Sampson was in on Sunday night, trying to sell Kevin on pairing up with Devin Ebanks in the Indiana frontcourt. Since I haven’t seen Jones play, I asked Dave Telep of Scout.com for a scouting report on the Mount Vernon forward. “I think Kevin Jones at the end of the day, is a workhorse type kid who has a desire to win and get better. He holds himself to very high standards. He’s one of those kids that you can toss aside where he’s rated or what different people think of him. I think he could play for anybody in the country because of his approach and his talent level. I think everybody’s looking for a Kevin Jones. There isn’t a style or a temperament, he just fits in. He’s a good basketball player.” Telep said. Pretty high praise from the guy I consider to be the expert when it comes to basketball recruiting on the national level. Jones certainly has the blue collar work ethic that Kelvin Sampson values in his players. I’ll be keeping a close eye on his recruitment as we head towards November. OK I am well aware of K.Jones but then I read today about some pritchett kid who is deciding between IU and Penn St. and he is a PF. Now there is a 20pound difference in him and K.Jones but I like what I am hearing about jones. Anyone know about this other kid? ITH, starting to hear that Kevin Jones may be at IUs MM, I think that might be where he decides that IU is where he belongs. I think he will fit right into what Kelvin Sampson is building, he is a winner and quite the player too. I live in upstate NY and had the pleasure of viewing many many of his games, he isnt flashy he just gets it done. Great outlet passer and relentless rebounder, nice stroke on his shot that goes out to the arc……….. I hope he picks the Hoosiers, he might be the best 4 year player in the 08 class. Once again IF we get him to MM I think he is a Hoosier, getting him off the east coast is going to be tough in the end though………….